Dr. Shanel Bhagwandin is changing the lives of patients with peritoneal malignancies, including mesothelioma. Dr. Bhagwandin is affiliated with the Mount Sinai Hospital Health System in New York. Recently, he has brought his experience in treating rare diseases to the Jupiter Medical Center located in Jupiter, Florida. This not-for-profit medical center is recognized for its outstanding physicians and innovative techniques for treating patients. “I came to Jupiter Medical Center because the hospital is committed to going above and beyond the scope of patient care,” Dr. Bhagwandin said. Sometimes patients have to travel to receive treatment. Dr. Bhagwandin understands that this can be difficult. With this thought in mind, he has helped initiate a program at Jupiter Medical Center to treat peritoneal malignancies with hyperthermic intraperitoneal chemotherapy (HIPEC). During HIPEC, a patient has heated chemotherapy washed around in their abdominal cavity. This procedure typically follows after the surgical removal of a patient’s tumors. HIPEC allows mesothelioma specialists to treat a patient’s disease more aggressively. By applying a high dose of chemotherapy directly to the site of a patient’s cancer, experts believe that it helps reduce the risk of it recurring. 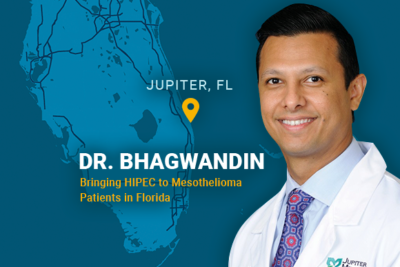 “I am the only board certified surgical oncologist in the Palm Beach County as well as other neighboring counties able to provide care for peritoneal mesothelioma and other peritoneal malignancies,” Dr. Bhagwandin stated. Receiving a mesothelioma diagnosis can be hard to process for both patients and their loved ones. “I firmly believe it’s important to take a step back, recognize there is a person in front of you, and address any obvious misconceptions before proceeding,” Dr. Bhagwandin explained. Second opinions can change everything. Getting an opinion from a mesothelioma expert can open doors to treatment options patients may have been denied before. Dr. Bhagwandin is a firm believer in second opinions. He consults with a number of medical experts to optimize treatment plans for his patients. “I routinely provide my patients here in Florida with a ‘second opinion’ from other Mount Sinai- New York surgical oncologists, medical oncologists, and gastroenterologists without them having to leave the area,” Bhagwandin claimed. In many circumstances, mesothelioma patients are misdiagnosed. Since this type of cancer is both rare and hard to diagnose, it is vital that patients seek a second opinion from a doctor that has experience treating the disease. Dr. Bhagwandin is a native of South Florida. He is beyond thankful to return to Palm Beach County and make a positive impact on the cancer community. “I’m grateful to return home and not only provide care to patients who haven’t had access to it but to make an impact in the area where I grew up,” Bhagwandin commented. Dr. Shanel Bhagwandin completed a fellowship in Complex General Cancer Surgical Oncology at Mount Sinai Hospital. After his fellowship, he joined Mount Sinai’s Division of Surgical Oncology. At Mount Sinai, he received training from Dr. Umut Sarpel and Dr. Daniel Labow. Dr. Labow is known for establishing the HIPEC program at Mount Sinai. Additionally, Dr. Bhagwandin has been mentored by Dr. George Salti at the Edward Cancer Center. “I’ve been able to participate in a number of cases for primary peritoneal malignancies as well as metastatic cases since 2013,” Dr. Bhagwandin said. For more information about getting connected to Dr. Shanel Bhagwandin, please contact Jenna Campagna. You can reach her by calling 888-385-2024 extension 102 or by emailing jenna@mesotheliomaguide.com. GETTING A SECOND OPINION. Palm Beach Florida Weekly. Retrieved from: https://palmbeach.floridaweekly.com/articles/getting-a-second-opinion/. Accessed: 05/18/2018. Shanel Bhagwandin, DO, MPH. Jupiter Medical Center. Retrieved from: https://www.jupitermed.com/find-a-doctor/b/shanel-bhagwandin-do-mph/. Accessed: 05/18/2018. Welcome to Jupiter Medical Center. Jupiter Medical Center. Retrieved from: https://www.jupitermed.com/. Accessed: 05/21/2018. Hyperthermic Intraperitoneal Chemotherapy. The University of Texas MD Anderson Cancer Center. Retrieved from: https://www.mdanderson.org/treatment-options/hyperthermic-intraperitoneal-chemotherapy.html. Accessed: 05/21/2018. Surgery in Oncology Is Not Always a Simple Decision. OncLive. Retrieved from: https://www.onclive.com/publications/oncology-fellows/2017/september-2017/surgery-in-oncology-is-not-always-a-simple-decision. Accessed: 05/18/2018. About Us. Jupiter Medical Specialists, LLC. Retrieved from: https://www.jupitermedicalspecialists.com/about-us.html. Accessed: 05/18/2018. Contact with Dr. Shanel Bhagwandin. Emails. Retrieved from: Personal Emails. Accessed: 05/18/2018.